They move slowly. It isn’t about speed, but mass and balance. The balance is between efficiency, fish and environmental protection. Screw generators extract the potential energy from large blocks of slowly downward moving water. The mass of the water turns the tilted screw. 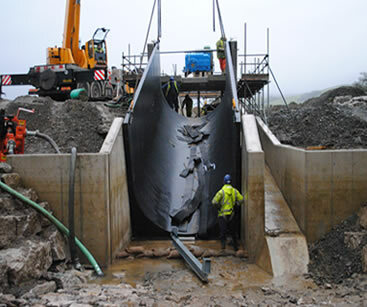 The flow of that mass is controlled by hydraulically driven sluice gates. Water enters the screw at the top, and the significant weight of that water is lowered slowly down to a lower level of the waterway as the screw rotates. If they enter the turbine, fish are not damaged. There is plenty of space for large or small fish, debris and ice blocks to pass through the machine. A gearbox at the top of the screw drives the a generator which produces standard three phase power for either the grid or direct users as state distribution laws allow. The entire facility is linked to an electronic monitoring and control system that runs automatically, but communicates to an operator whenever requested. Safety, shutdown and management protocols are strict and efficient. Engineering choices are critical to the right balance. Selecting the Archimedes screw: Choosing the largest screw may maximize the power output by utilizing high volumes of water at times of flood, but this increases cost and can create the risk of changing the dynamics and the ecosystem of the river. At the other extreme, we can install a very small, less costly screw that does not fully use the available flow of the waterway. NEHC's expertise and experience enables us to find the balance among all of these elements and to engineer the highest quality projects. Each site offers a unique engineering situation. Deriving the best project by project solution where respect for environmental issues, selection of the appropriate generation capacity, and determining stable cost factors enable us to drive toward the best return on investment for all parties. 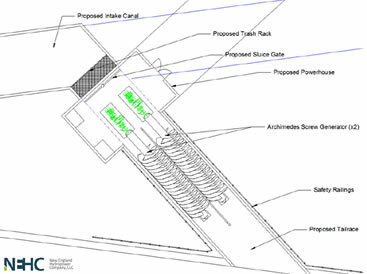 During the feasibility stage, two critical elements dictate the size of the Archimedes screw: The drop in the water level from above the intake to below the discharge—roughly the height of the dam. 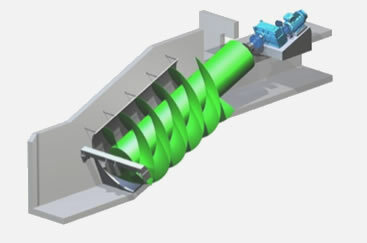 A hydro-screw runs most efficiently as a generator at a fixed slope of 22 degrees. This coupled with the drop determines the length of the machine. The second element is the volume of water available to pass through the machine. Local rainfall and the size of the river catchment upstream determine this. The more water that the turbine can accept due to good water flow, the greater the diameter of the machine. One more factor is to protect both the aesthetics and environment of the site: An allowance is made for a significant water volume to by-pass the turbine and sustain the river habitat with continuing flow over dams, even in dry periods. At every site this is part of the calculus that drives balance. NEHC’s systems are designed for entirely safe operation under all conditions. 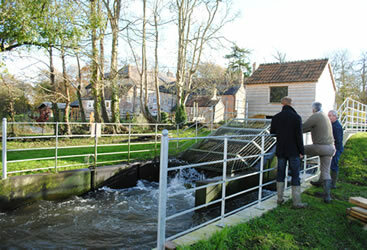 Water flow velocities at the intake are kept low ensuring safe recreational activities. The entire screw mechanism and all the flow channels are guarded to ensure that no one can fall in to the turbine. Every aspect of the electronic monitoring and control system is designed to be ‘fail safe’ so that if a problem occurs the system will automatically shut down without the need for power or intervention. 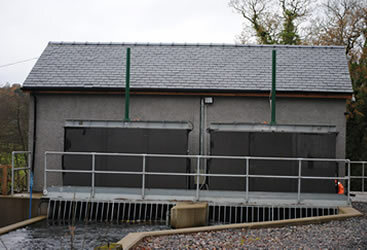 There are operational and safety sensors as well as river height sensors customized to each installation. NEHC sites require a “power house.” One of the first questions NEHC constituents want to know is, “What does it look like?” The answer parallels the engineering conversation: Each site is unique and requires good selection and design sensibility. The goal is to create a facility that is a good complement to what is around it. It will be part of the local landscape for a relatively long period of time, so it is important. The houses are tailored: wood clapboard, stone and brick facing along with more standard external materials are considered in the context of the project costs and the local environment. The equipment is not in the middle of the dam, but on the side in every case, preserving the natural allure of seasonal water flow over each dam. Dams need repair. Fish need to migrate. NEHC is careful to evaluate the quality of dams that are promising for power generation. In some cases, these requirements may be beyond the company’s ability to repair and then build an economically viable generating facility. At other sites, there may be excellent reason to pursue both repairs and improvements prior to developing generation. Each site requires feasibility study to determine the course of action.